Mark Wahlberg poses for a portrait during the "Ted" press day on June 16, 2012 in Beverly Hills, Calif.
Mark Wahlberg was in a somber mood at the New York premiere of his new film, "Pain and Gain"— still grappling with the tragedy that struck his hometown in Boston. Earlier Monday two bombs went off near the finish line at the Boston Marathon. Three people were killed and at least 140 were injured. "I really didn't even want to come tonight. I hadn't really heard much — I spoke to my mom, and most of my family seems to be OK. It's such a big event, there's so many people there. It's horrible man. It's (expletive) disgusting, man. 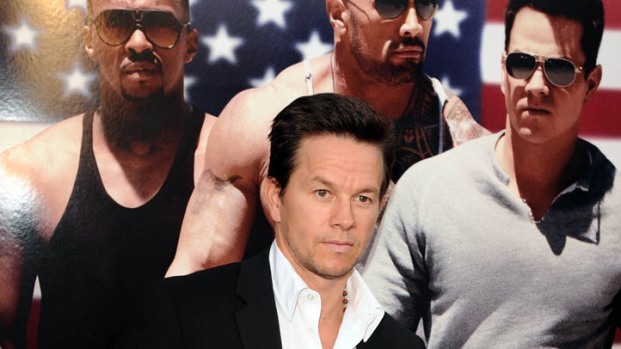 I just - I'm very upset," Wahlberg said Monday night. "You try to put everything in God's hands and whatever happens here is out of our control and there's a bigger picture. But it's still obviously upsetting," the 41-year old actor said on the red carpet before going into the premiere hosted by The Cinema Society. New York rapper 50 Cent was a guest at the premiere and before going inside, he expressed his dismay. "Why is it even happening? But there's no explanation. We don't even know what happened (yet)," 50 Cent said. He added: "When you see kids involved in it, I can't write it off. I can't say maybe (it was) karma that is why the kid was where he was." An 8-year-old boy was among the dead. But the rapper said the tragedy doesn't make him feel less safe than usual. "If anyone is feeling that way they have to allow themselves accept the reality that we don't have control of our fate," he said. Before coming to the premiere, "Nurse Jackie" star Peter Facinelli was running on his treadmill when he saw the news on television. "My heart goes out to the families and the victims. I don't know who caused it, just like everyone else, I'm in the dark. I'm waiting to get to the bottom of it," he said at the event. "If it was terrorism, people are going to need to know they're not going to stop us," he added. "We're not going to be afraid. So for me, the best thing to do is to not hide inside. Proceed with caution but live your life." Authorities still don't know who is responsible for the attack. Some 23,000 runners took part in the race, which attracts more than 500,000 spectators and finishes up in the heart of central Boston, near the landmark Prudential Center and the Boston Public Library. It is held on Patriots Day, a Massachusetts state holiday which commemorates the first battles of the American Revolution in 1775.